It’s never easy to say good-bye. One year ago, today, we said good-bye to my mother. I think it was a beautiful service and I think she would have liked it! We truly honored her. My brother, Bill, has a son, Chris, who is a minister. We asked him to officiate at the service. He did a fine job! I’m proud of him. Both of my brothers and I each gave a tribute to Mother. Vel, Bill’s wife, also gave a tribute. Richard’s daughter, Susan, sang by means of a tape since she couldn’t be there. Richard’s other daughter, Heidi, played the piano. Three of my children, who were there, Pam, Tim and Christy and Lisa, Bill’s daughter, read scripture. Lisa is a State Park Ranger and she ate lunch with Mother every Wednesday. She always had her ranger clothes on so she wore them to the memorial service. You can see her in the picture. Each of the grandchildren and great-grandchildren, who were there, took a red rose up to lay on the table. 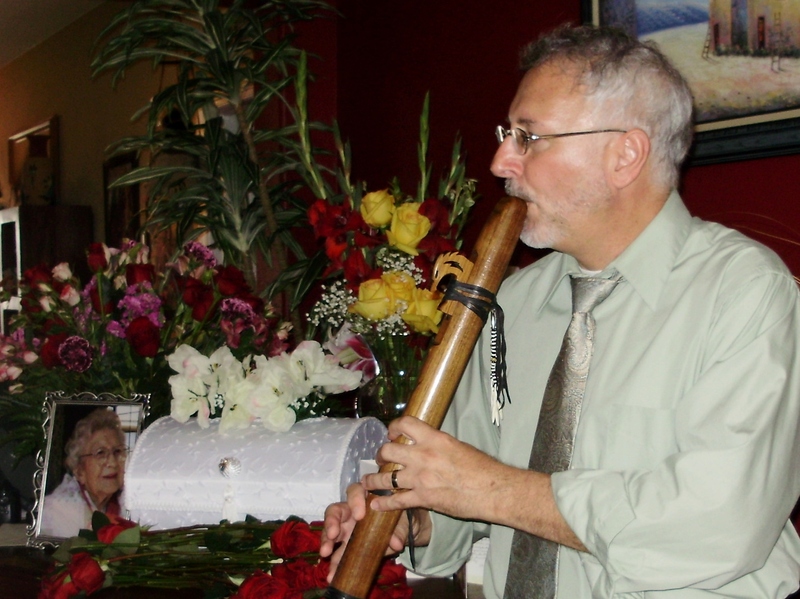 The chaplain from the nursing home played his Native American Flute again. I have copied and pasted my tribute to Mother here. I was born in the time when the three words I Love You weren’t used in everyday conversations. Love was shown but not verbalized. I knew, without a doubt, Mother loved me, even though she never told me. One day this was put to the test. I was home from school for the summer. The youth group from our church were going on an all day picnic to a state park and invited me to join them. A car came to pick me up early on Saturday morning. They insisted I sit in the front seat! That seemed strange but I got in and off we went for a fun day! It was getting close to lunch time and I was very hungry. I looked in a box for a snack and saw a small piece of paper with my name on it! Oh, what was this? I read it in shock. It was written to the leaders by one of the girls in the youth group. “I’ll ride in any car but not in the car with Anita Williamson.” What? Why? Oh, that explains why I had to sit in the front seat… The girl who wrote the note was in the back seat! Somehow we had ended up in the same car! Oh, what to do…I had no idea I wasn’t liked. I couldn’t stay here. I’d better leave. Where should I go? How could I get home? There was nothing I could do except walk away. Yes, that’s it. I’d simply walk away and not come back. I’d become a run-away. What??? I’d never heard those three words, come to me, from Mother before! I stood there not knowing what to say… Finally I said, “ Okay, I’ll talk to you later. Bye.” For the next couple of days all I could think of was Mother telling me she loved me! It meant so much to me. I knew I’d have to say it too! Could I? I didn’t know. But finally I made up my mind that I would say it the next time we talked on the phone and I did. I’ve been saying it to her ever since. I love you, Mother. 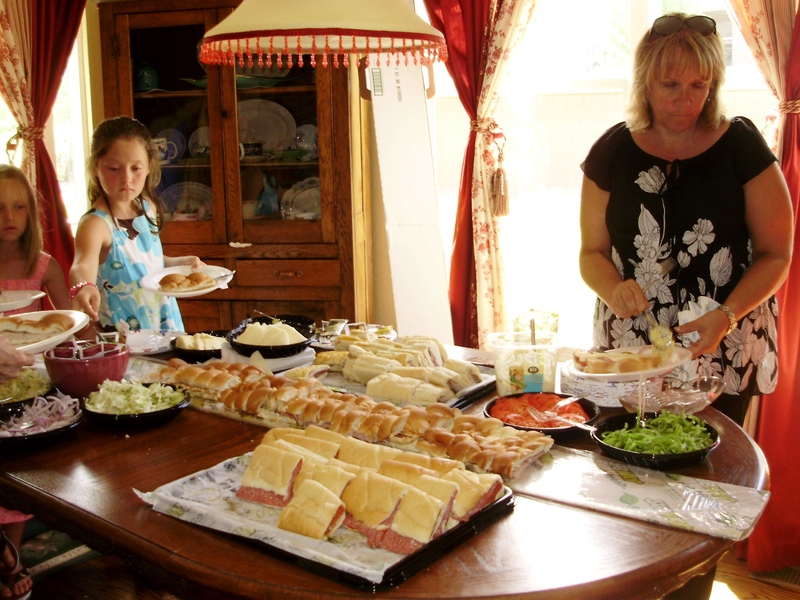 After the service everyone was invited to Bill’s house for a luncheon. 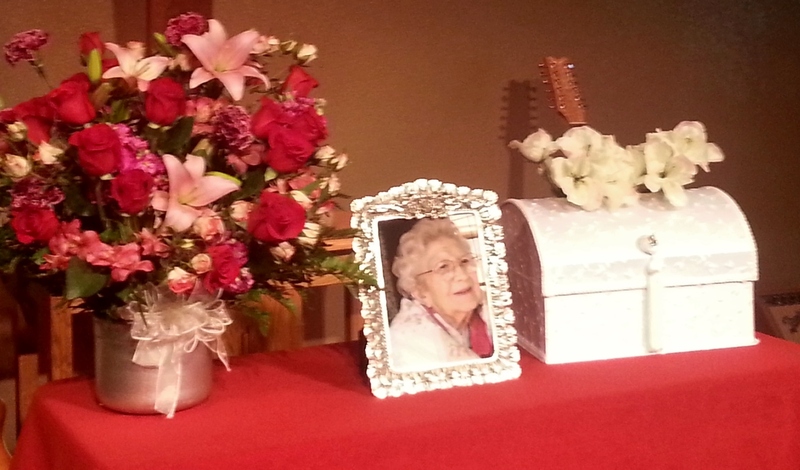 We brought flowers, pictures, and all from the church and arranged it all on the Baby Grand piano. Then, as folks visited and ate music could be heard as Chaplain played his Native American Flute again, at our request. It was a long day, but a good day, in loving memory of Mother. This entry was posted in Bill, Chris, Christy, Colorado, Death, Family, Flowers, Grandchildren, Heidi, Lisa, Me, Memorial Service, Memories, Mother, Native American Flute, Pam, Richard, Susan, Tim, Vel and tagged Bill, Christy, Colorado, Death, Family, Grandchildren, Heidi, Lisa, Me, Memories, Mother, Native American Flute, Pam, Richard, Susan, Tim, Vel. Bookmark the permalink. The memory of my mother’s service in July is fresh on my mind. Different words, different images and music – but the same heart-felt sentiment. A lovely tribute.